Fig species which is native to South and South-East Asia. This evergreen tree is particularly good for bonsai training as they produce sturdy trunks, good branching characteristics and shiny leaves. Best to trim in early summer as the new leaves that subsequently grow will be smaller than the ones removed. Ours is trained in the coiled trunk style. Great for indoors year-round, the brighter the location, the more compact the growth. 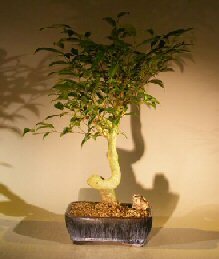 Recommended Indoor bonsai tree grown and trained by Bonsai Boy.